Online baby products seller FirstCry is acquiring offline retailer Mahindra BabyOye for Rs 362.1 crore in a primarily stock deal, a development that signals how building an offline presence is becoming important for vertical etailers. Founded by serial entrepreneur Supam Maheshwari, First-Cry will acquire the unit of $18 billion software-to-automobiles congolmerate Mahindra & Mahindra, which in turn will invest in the Pune-based startup. FirstCry has now been valued at $300-350 million (Rs 2,000-2,330 crore), according to two sources familiar with the matter. The deal will nearly double its valuation from about $155-160 million last year. Mahindra’s will get a minority stake in FirstCry as part of the transaction. FirstCry owner Brainbees Solutions will issue shares worth Rs 354.6 crore to Mahindra Group and pay Rs 7.5 crore in cash, according to filings made with stock exchanges. As a part of the transaction, First-Cry has also raised Rs 226 crore ($34 million) in fresh funding from Mahindra, Switzerland’s asset management company Adveq and Infosys cofounder Kris Gopalakrishnan, besides existing backers like SAIF Partners, IDG Ventures India, NEA, Valiant Capital and Vertex. The deal will help FirstCry create one of the largest omnichannel distribution plays in India with nearly 300 stores across 125 cities in the country. The company had earlier said that it planned to open 700 franchisee stores in the next 3-4 years and the Mahindra brand will help it build more trust in the market. “With this transaction, our true omni-channel potential will evolve as we will have a significant network to take the orders online and get them delivered or picked up from stores,” CEO Supam Maheshwari said, adding that customers order 11 times a year from FirstCry. He declined to comment on the valuation. The deal will help First-Cry move faster towards its goal of profitability, as it leverages scale to drive cost efficiencies, rope in more brands and even expand to international markets. 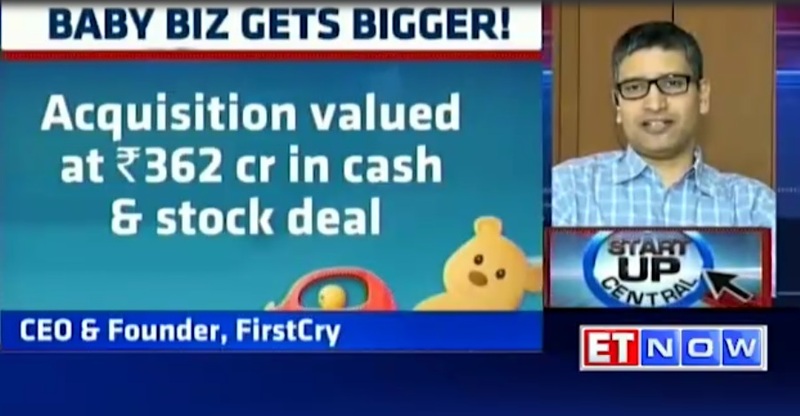 FirstCry will also look at more acquisitions, especially in segments like kidswear brands and digital media startups targeting parents, according to Maheshwari. FirstCry’s acquisition of Mahindra BabyOye reverses the trend of justoffline players such as Future Retail acquiring Fabfurnish at a distress price of less than Rs 10 crore and Titan Company buying 62% in online jewellery retailer CaratLane for Rs 357 crore. All vertical etailers, from eyewear player Lenskart, furniture seller Pepperfry and lingerie player Zivame, have built or are building a large offline presence. Even fashion portal Myntra, part of Flipkart, plans to sell its private labels through offline retail. The move also comes at a time when the world’s largest retailers are looking to build omnichannel players. US brick and mortar retail giant Walmart has made building an online presence a priority, also acquiring etailer Jet for $3.3 billion. On the other hand, online retail giant Amazon reportedly plans to open retail outlets in the US. The baby and mother-care segment presents a $12-billion market, but it also presents its own challenges given the complexity of products. “It holds huge potential but it’s also troublesome to operate as it has a mix of FMCG type of products, then apparel and then also more durable products which do not sell as fast,” said Devangshu Dutta, CEO at retail consultancy firm Third Eyesight. Mahindra Retail operates stores under BabayOye in two formats, 39 under franchisee agreements and 81 company-owned stores. While FirstCry is acquiring the franchisee division, Mahindra Retail will continue to operate company-owned stores as it becomes master franchisee for the brand. Mahindra Retail will shut down its online commerce business under BabyOye, a startup which it acquired in 2015 in order to build out its online commerce business. Experts tracking the space said the deal will give FirstCry access to Mahindra Retail’s stores, which are located in more premium or high-street areas, besides international kids brands like Carters. Mahindra BabyOye had seen revenues stagnate between Rs 205 crore and Rs 230 crore for the last three financial years. The business was also reporting losses ranging from Rs 114 crore to Rs 121 crore during the period, and the deal allows the conglomerate to offload a business which was not core. “With this deal, Mahindra is consolidating its presence in the space, and FirstCry will become most powerful and well-financed entity,” said Bhiwandiwala, who will also join the board of FirstCry.